Booya. That easy. You can combine all together and mix with your hands or fork. It’s NOT like regular wheat flour so what I do is roll it out slowly or use my fingers to spread the crust out on a pizza pan. The grapeseed oil makes it feel a bit “greasy or buttery” so I actually covered my pizza pan with foil just so it was easier to clean up. You can make this crust REALLY thin and it will still hold like a normal pizza. It’s not like most gluten-free crusts where it crumbles apart. I baked it by itself until the edges got a bit brown. Then I took it out and added my toppings! Baked it again until it looked done. Ta-Da! 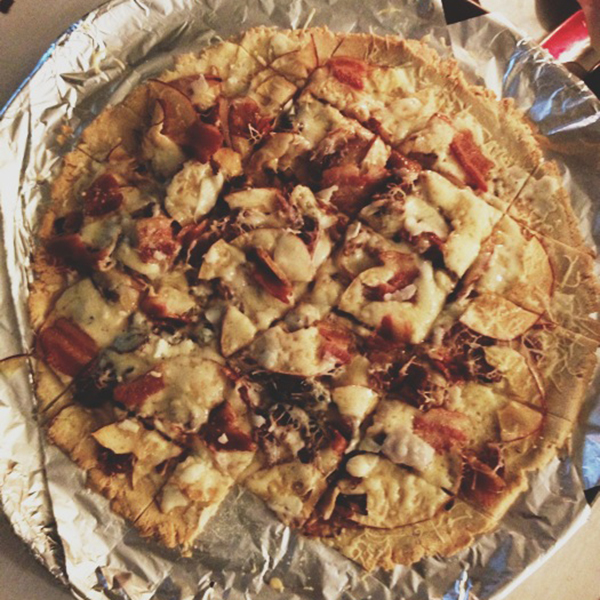 I made this bacon / gouda / onion / apple pizza that I make every fall/winter. It’s SO good. FYI you can’t tell but that pizza pan is pretty huge and I realized after that I probably could have rolled the crust out even thinner. FYI – I am NOT eating a Paleo diet. I eat dairy (NOM cheese) a lot. 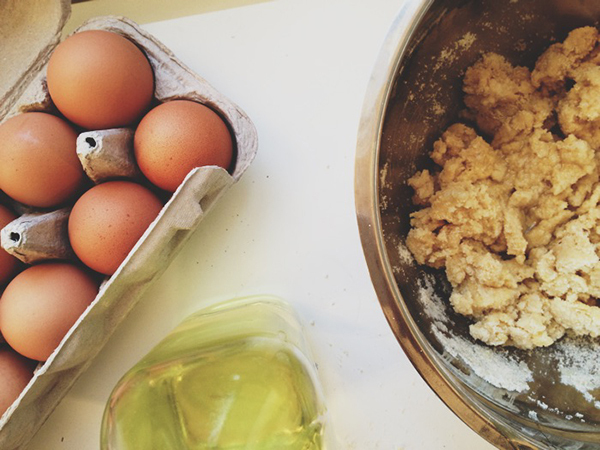 I just avoid grains + sugar when I cook at home. I adhere to a gluten-free diet when I’m out to eat or at someone’s house. Read about my switch to grain-free eating here. I was about to complain about the price of shipping for the Nuts.com flour, but then realized the grand total was still less than the cost of an average pizza. TRUTH! I sometimes think that too. I bought the 5 lb bag and it’s so worth it. Looks like you had a good weekend – Hopefully it was relaxing.